Translation of the cuneiform:"Go up, Urshanabi, on to the wall of Uruk and walk around, survey the foundation platform, inspect the brickwork! (See) if its brickwork is not kiln-fired brick, and if the Seven Sages did not lay its foundations!" The image is a blood fluke called Schistosoma mansoni. The female animal fits into a slot in the male animal, and they remain physically attached to each other until they die. In the text, Gilgamesh has resigned himself to not finding immortality, and to the fact that Enkidu is gone. All he can do is hope that the Uruk city walls -- something he has built -- is his legacy. After I die, I think that all that will be left is the artwork I have made. Gilgamesh gives up, but Gilgamesh will remain attached to Enkidu forever, even though Enkidu is physically gone. This series of 10 drawings is based on the ancient Mesopotamian story of Gilgamesh. "Gilgamesh" appears on cuneiform tablets (an ancient form of writing on clay) dating to about 2000 B.C.E. It relates an epic journey made by the King of Uruk, Gilgamesh, and his friend, Enkidu. The story is also about what is and is not eternal and significant. These 10 drawings, like the story, are about permanence versus transience, and about trying to determine what is important and what is inconsequential. 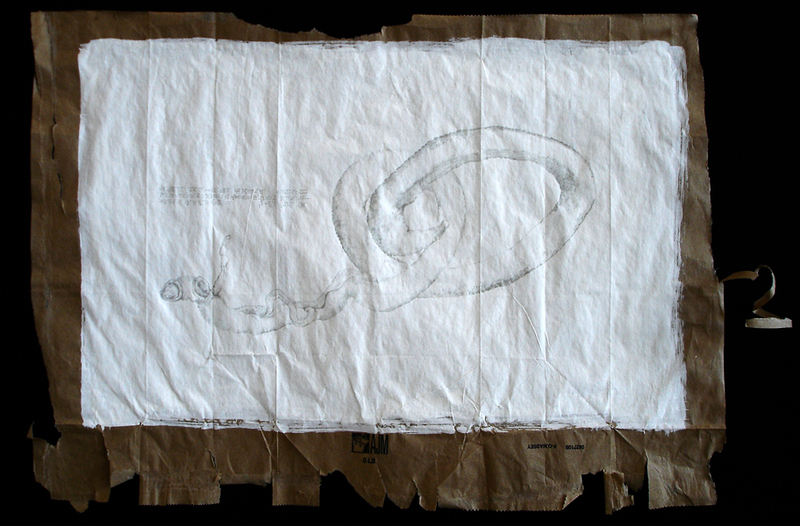 The drawing substrate - paper bags - comment on disposability and value. Like excavated archaeological material (most of which is ancient refuse), when the paper bags are put into a different context, their significance changes. Also like excavated archaeological material, the paper bags will deteriorate over time. In this way, the drawings are like the ancient tablets on which the story of Gilgamesh was written. All of the drawings in this series are made by drawing with sharpened silver or copper wire. The lines are created by transfered metal particles, which means that the drawings themselves will tarnish with time, like archaeological objects.